"An encounter with the TIDAL La Assoluta is impressive, again and again. The pure physical facts alone of this huge speaker with a weight over half a ton is the reason for many comments. Also the pair price like a fully loaded Rolls Royce is something, but the finish is on par with that just out of this world. 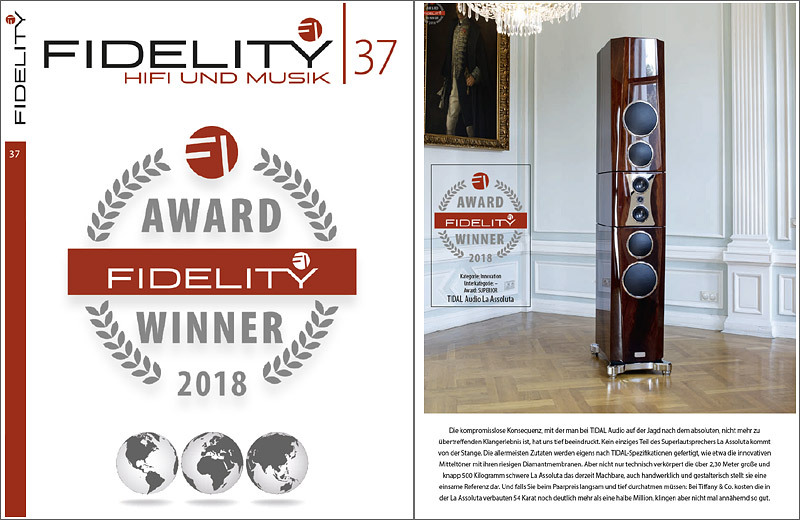 But this FIDELITY award is for a real innovation in this case: not only the tweeter, also the midrange woofer diaphragms are made out of diamond. The consequence of hunting for the most realistic sound free of compromises of TIDAL deepley impressed us. Not a single part of the super speaker La Assoluta is of the shelve. But not only technically this speaker embodies the current state of the art of what is possible, also in terms of craftsmenship and design the La Assoluta is an unique reference."